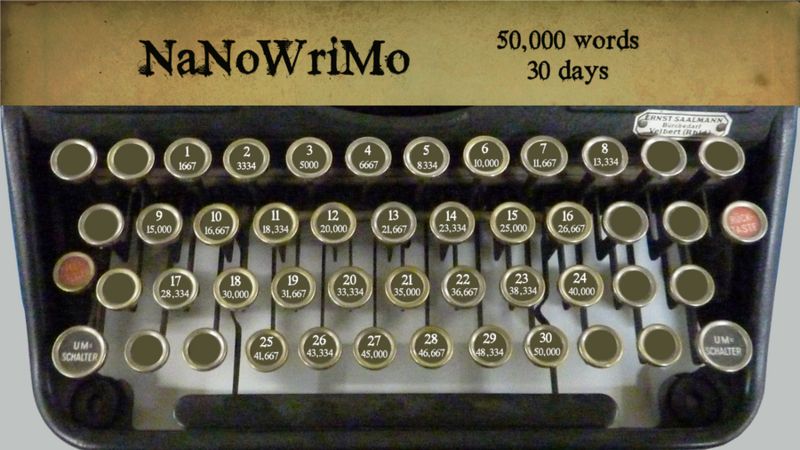 As you already know, I am participating in NaNoWriMo this month. Click here if you want to know how the first week went, or here if you just want to know what I’m talking about in general. So, to get it out of the way: I am massively behind on my word count. As of right now, I have written 19,090 words and I am supposed to reach 25,000 by the end of the day. Yep, something went wrong and unfortunately I know exactly what it was – the curse of Week 2! Okay, I’m just kidding. It was my own fault. By the time you get to week two, a couple of things happen. On the one hand you are flirting with the idea of writing an entirely different story, but on the other hand you know exactly that you wouldn’t like that story much either, if you had started with it. So, it is wise to stick with what you got and to stop worrying if it is any good or not. The most important thing during NaNoWriMo is to keep writing, no matter what. But during the second week, you are bound to get tired of your own story, therefore you are allowed to take a few days off from writing, but not more than two consecutive days in a row. Well, I didn’t write for four days and it totally backfired. I lost touch with my story, had to re-read a lot of scenes because I forgot some things, which lead to me editing a lot more than I should and it just generally showed in my writing. But right now, I am actually pretty happy with my “novel”. I like my characters and think they have potential, but I am not yet halfway through the story, which is a bit worrying. Things that I wanted to happen during the course of a year, happened within a week and I might have to edit that after November is done, but right now I’ll just focus on continuing the story the way it is at the moment. I often have the feeling that I’m running out of ideas, until something really funny comes to mind again. Writing truly was an up and down the past week. So, what am I going to do the next week? I will try to catch up on my word count and I definitely want to get my story moving. I have the tendency to write a lot of dialogue, which doesn’t really move things along. I have no idea how this little project will turn out, but I can tell you one thing: I am not giving up! This is all so true. I thought about changing my novel this week too, but you’re definitely right – better sticking with the one you started with and worry about editing later. Good luck for this week! I hear it’s pretty common among the participants. It’s this typical “the grass is always greener on the other side” situation, so I figured I can always write the other idea later on. Thank you 🙂 good luck and happy writing to you too! Hey, thanks for the like. Good luck to you for the rest of NaNo! Thank you :)! Good luck for reaching your target as well!